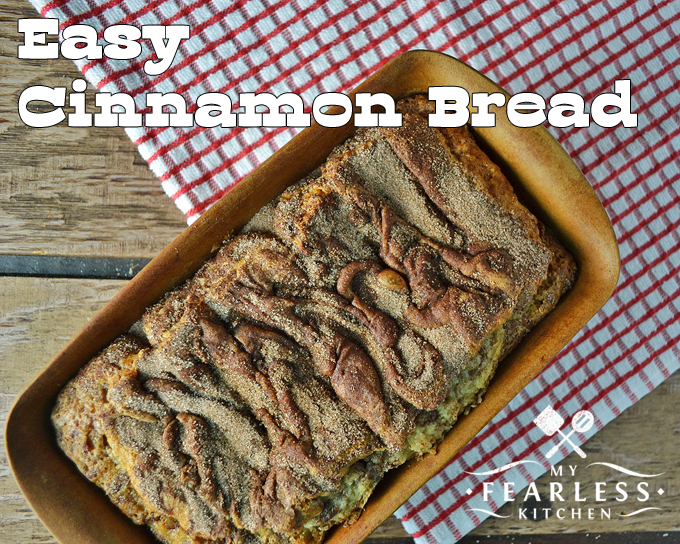 This Easy Cinnamon Bread is so easy to make, so pretty to look at, and so yummy to eat! Cinnamon Bread isn’t just for fall, make it any time for a great treat. I’m just going to put this out there. I love carbs. And I have a serious sweet tooth. (Candy corn will be the death of me!) I love having donuts for breakfast… and I’m trying really hard to set a better example for my son! 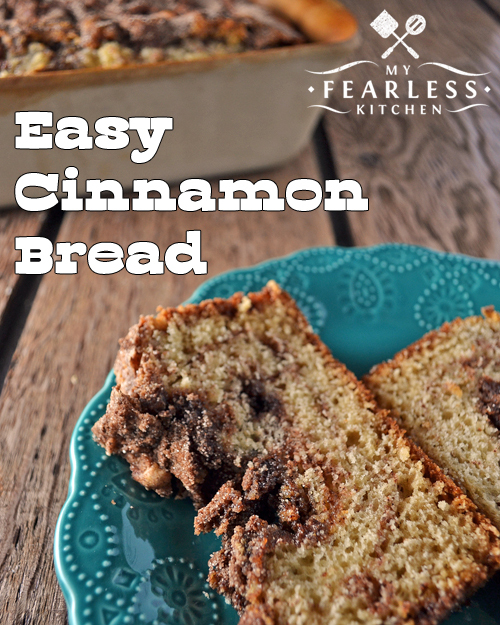 But this Easy Cinnamon Bread… Oh my gosh! I found the recipe in Gooseberry Patch’s “Autumn in a Jiffy,” and I am in love with it! It’s a quick bread, like zucchini bread or banana bread, so it is really fast to make. You don’t have to wait for the yeast to rise, the baking soda does all that work for you. Just mix the ingredients together and you’re almost ready to go. This recipe does take a few small steps, once you have your batter mixed. You’ll need to mix up the cinnamon-sugar in a separate bowl, and layer that in your bread pan with the batter. Pour half of the batter in the bottom of a greased bread pan. (If you’re not sure, go with a little less than half for this layer.) Then spread half of the cinnamon-sugar mixture on top of the batter. (Use a little more than half of the cinnamon-sugar in this layer.) Pour the rest of the batter on top of the cinnamon-sugar. The batter will spread out to mostly cover the cinnamon-sugar. Then spread on the rest of the cinnamon-sugar. Use a butter knife to swirl the cinnamon-sugar into the batter. I used a back-and-forth motion, making S-shapes. The rest of the cinnamon-sugar will form a beautiful, crunchy crust on top of your bread. And who doesn’t love crunchy cinnamon-sugar? The swirls in my first loaf of Easy Cinnamon Bread didn’t come out beautifully, but by the second loaf I had my technique down. Use that as an excuse to make more Easy Cinnamon Bread – you need to practice your swirls! This Easy Cinnamon Bread, a huge cup of coffee brewed with Pumpkin Pie Spice, and a cool fall morning – that’s sounds like a pretty good morning to me! 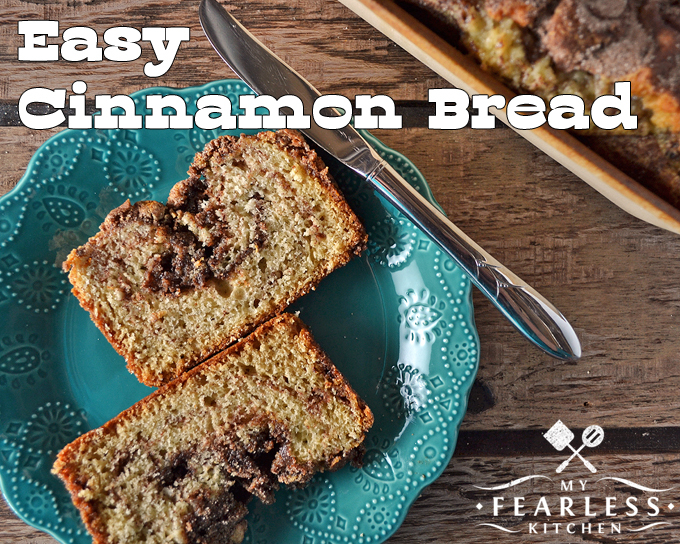 This Easy Cinnamon Bread is so easy to make, so pretty to look at, and so yummy to eat! Cinnamon Bread isn't just for fall, make it anytime for a great treat. In a large bowl, beat together egg, oil, and 1 cup sugar. Set aside. In a separate bowl, mix together flour, salt, and baking soda. Add flour mixture and buttermilk to egg mixture, stirring well. In a small bowl, combine ½ cup sugar and cinnamon. Mix well. Spoon half of batter into a greased 9"x5" loaf pan; pour half of cinnamon mixture over batter. Repeat layers. Swirl batter and cinnamon with a knife. Cool on a wire rack for 10 minutes before turning bread out of pan.